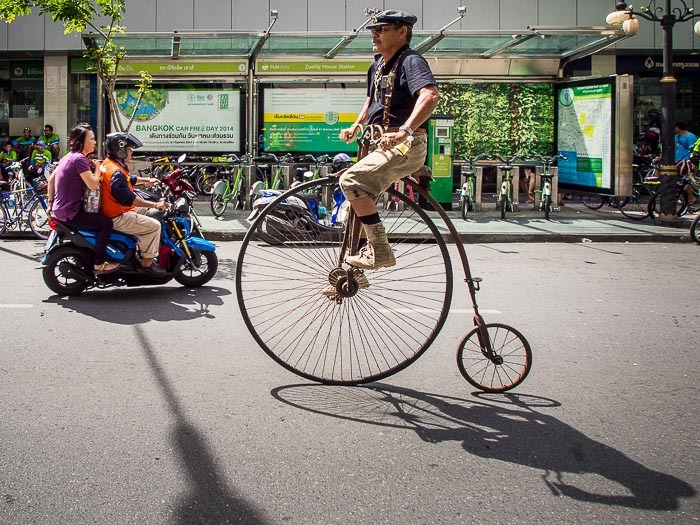 A man pedals his penny-farthing up Silom Road in Bangkok on Car Free Day. Car free did not mean motorcycle free. Sunday was Car Free Day in Bangkok. Several of the city's streets were closed to cars so people on bikes could navigate the city's streets in relative safety. Most of the bikes were a lot more modern than this gentleman's bike, an old "penny-farthing" design. Penny-farthings date from the early days of bicycling and reached their peak of popularity in the 1880s. They were called penny-farthing because they reminded people of two British coins, the penny and the farthing. The penny was a unit of currency equaling one two-hundred-and-fortieth of a pound sterling and the farthing one nine hundred and sixtieth of a pound sterling. The composition of this photo is 100% luck. I was running along the side while he pedaled photographing. He was moving along at a pretty good clip and I was having a hard time keeping up. It wasn't until I got back to my computer at the end of the day that I realized this photo had everything. The "penny-farthing," the motorcycle taxi behind it and then, in the background, the Bangkok Car Free Day advertisement.